Sundown Villa provides views of the ocean with the security of a gated entrance. Whether you’re honeymooners or a vacationing family, this four-bedroom home will provide a plethora of amenities. This fully-staffed residence is near local entertainment includes restaurants, shopping and golf, as well as an active nightlife scene to keep you entertained well into the early hours of the morning. Offers modern conveniences such as plasma screens, stainless steel kitchen, and high speed internet. 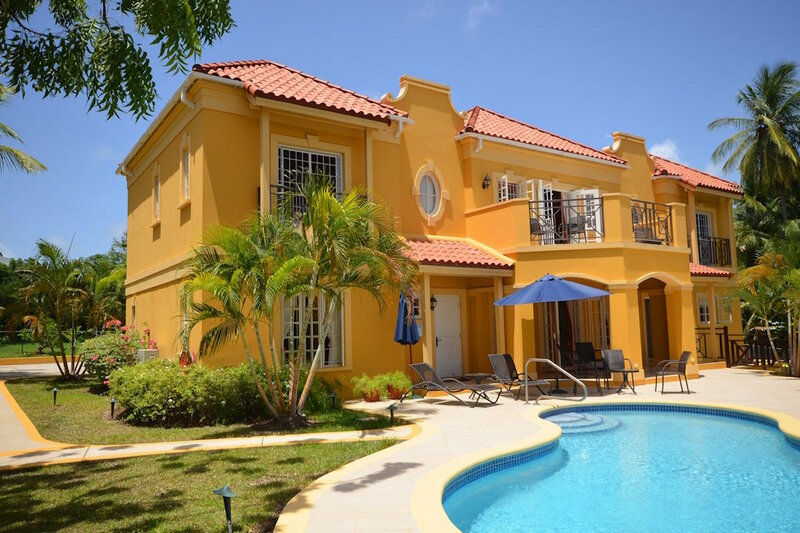 Sundown villa is located opposite the world famous Mullins Beach, and has ocean views. It is tastefully decorated and includes modern amenities. The home’s abundant outdoor space lends plenty of room to take in the sunset. This villa has 37,000 square feet of landscaped gardens and a gazebo with a full range BBQ grill and dining table. A stone patio with loungers winds around the oblong swimming pool, and there’s a shaded hammock off to the side. After swimming in the pool, rinse off in the outdoor shower before heading back inside. The patio extends to the veranda, which provides shade for seating without obstructing the view. On top of the extensive outdoor amenities, guests can rest easy knowing there’s a highly-rated safety alarm and security system. Inside, there’s an entertainment room with a computer, photo printer, 42-inch Plasma TV, games, books, and exercise equipment. Modern amenities continue in the kitchen, which is fully-equipped with stainless steel appliances, ample cookware, a coffeemaker, Nespresso, and blender. There’s also a Culligan water softener/purifier throughout the home. There are four air-conditioned bedrooms with ensuite bathrooms and ceiling fans. Three of the bedrooms have ocean views. The master bedroom and the second bedroom are both located upstairs and have king beds. The third bedroom is also upstairs and has two queen beds. The fourth bedroom is located downstairs, offers a queen bed, and is best for children or staff. There’s also a powder room in the common area. There are several popular restaurants and bars along Barbados’ Platinum Coast, although there’s little need to leave the villa. Sundown has its own cook and staff who work 6 days a week and serve three meals a day. This villa is ideal for large groups, as there’s parking space for up to 10 cars. Sundown Villa was all that it promised to be… 20 yards from Mullins Beach, with monkeys in the garden. The staff is amazing, with Will’s fabulous cooking and Leanne’s care and cleaning. There’s a great pool and comfy beds, with quiet nights and relaxing days. Sundown is absolutely great!! We will be back.